A couple of years ago, I was searching the Internet to find comics about homeschooling and I was not finding much, but doing an image search I discovered a delightful but virtually unknown comic strip artist, Cristina Ramos-Payne. She not only devoted her talents to portraying the lighter side of the homeschooling lifestyle, but had a blog, Home Spun Juggling, where her comics could be viewed by the public. Now the really interesting thing is that Cristina does not just juggle her life at home, but she really does juggle! Since I have found this delightful woman, I have spent hours giggling through her older posts as well as waiting in anticipation for her latest rendering of homeschool humor. I have even featured a few posts on her work with links back to her website in the past. I highly recommend No School Today? 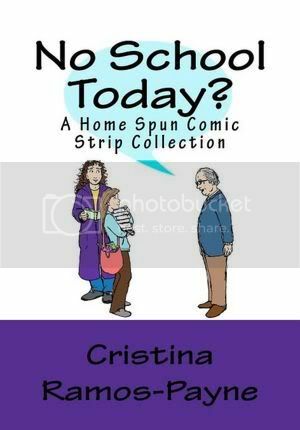 A Home Spun Comic Strip Collection to all homeschooling parents! First of all, any homeschooling parent would get it and probably has lived through it. Second, true to the backbone spirit of homeschooling Cristina published the book herself. Third, it is only $10 for about 200 comic strips in a book that you can take anywhere, even where computers cannot go, and she has some in the book that had never been published on her blog. Now if I could just get my copy back from my daughter! I could use a laugh today, how about you? Wow! Thank you so much for your sweet review. I'm humbled by your words! My favorite thing to hear from readers is that my work made you laugh. Every smile my work creates makes me happy too! You are most welcome, Cristina.